In early September I headed to the Dominican Republic for a week long shoot for Physicians for Peace. The trip made for long, fast paced days as we covered an incredible amount of ground in a short time. My goal was to visit several of Physicians for Peace’s programs in the country with Ramon Lopez, Physicians for Peace’s Medical Operations Director in the Dominican Republic, and Physicians for Peace marketing and communications manager Erin Wickersham. In all we visited an orthopedic clinic, burn center, documented several patient success stories, and shadowed a group of resource mothers working in their communities. Resource mothers at work in Santo Domingo, Dominican Republic. Crafting molds for amputees in Santo Domingo, Dominican Republic. Working on prosthetics in Santo Domingo, Dominican Republic. A double amputee gets his prosthetics fitted in Santo Domingo, Dominican Republic. A burn patient gets care in Santiago, Dominican Republic. A patient success story outside of Santo Domingo, Dominican Republic. A family outside of Santo Domingo, Dominican Republic. While I did shoot some still photography, the main objective was to get video content for the Physicians for Peace's 25th annual gala this fall. So, with video being the priority, I shot almost entirely with the Sony FS700. This was my first time in the field with the camera I had only just recently purchased. I did bring a 5D mark iii as well but the FS700 was a true gem. Showing some kids footage in Santo Domingo, Dominican Republic. Shooting footage on a cherry farm outside of Santo Domingo, Dominican Republic. Besides being a true video camera (sorry DSLR fans) my favorite thing about this super 35 camera is the ability to switch to Canon lenses with the help of a Metabones E-mount. The other is the ability to shoot in 240-frames-per-second at full HD. (albeit in 8-second bursts) This makes for some pretty neat slow-motion. It was the first time I’ve ever made decent or even usable footage from a car window while driving above 30mph. The video below shows some examples I shot in the Dominican Republic that demonstrate FS700’s slow-motion capabilities. All and all a wonderful trip. I couldn’t end without saying how remarkable my two team members were in the Dominican Republic. Ramon’s somewhat assertive driving abilities coupled with a carefree latin flair got us everywhere we needed in record time and kept us smiling. Erin’s planning and organization kept the two boys on track and us all focused on getting the right content. These two made my job incredibly easier and less stressful. Most importantly, we captured the type visuals we needed to highlight the important work being done by Physicians for Peace. From left: Brian Clark, Erin Wickersham and Ramon Lopez. In early July, Brian J. Clark Productions headed to Port-au-Prince, Haiti for my second year at Camp Jacob. Only a month earlier, I had resigned from The Virginian-Pilot, went to New York City to buy video and photography equipment at B&H. Soon after, my wife and I packed up all of our belongings and drove across the country for our move to Portland, Oregon. Whew! My task at Camp Jacob was to document, through video and photography, the week long camp for disabled orphans from St. Vincent’s in Port-au-Prince. For four years now, the founder of Jacob’s Color Link Initiative, Tom Landry, has given these kids an opportunity (they rarely get) to leave the confines of their orphanage. 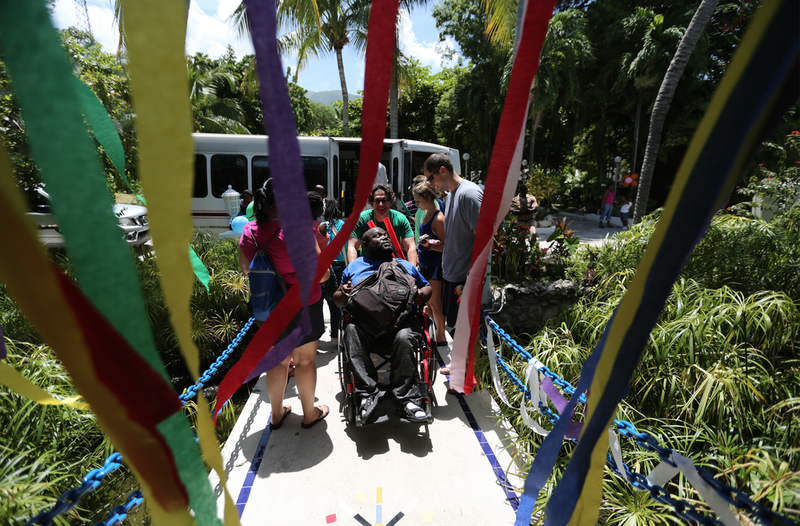 They spend a week by the sea full of therapeutic activities designed with their disabilities in mind. It’s a week of incredible transformation for the dozens “campers” and the twenty “councilors” from all over the United States and Canada. I encourage you to learn more about Jacob’s Color Link Initiative. It is a marvelous program for some of the most vulnerable Haitians. At Camp Jacob, I was able to field test several new pieces of equipment, including slide and steady-cams, a few new lenses and miscellaneous items. Everything seemed to work as planned, except for the unfortunate mistake of using my mono-pod in salt water. It was a silly move on my part. Luckily, I was able to repair it stateside. Next, Brian J. Clark Productions will head out to The Dominican Republic to document some of the amazing work being done by Physicians for Peace. Thoughts, impressions? Please comment below, love to hear from you! Copyright Brian J. Clark Productions LLC.